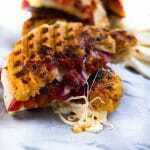 Few things in life are as comforting as a crunchy panini with a creamy and cheesy, gooey center. This spicy caprese panini boasts a super tender and crunchy focaccia bread and is spread with a deliciously spicy and creamy aioli. Prepare to meat the ultimate panini. Add all the ingredients into a blender or food processor and process until smooth. Feel free to leave some of the chipotles or tomatoes as chunks if you would like. Preheat panini press to high. Assemble the sandwiches first by smearing both sides with the chipotle mayo then layering on the fresh mozzarella cheese followed by the tomatoes and then the onion. Top off with the other side of focaccia. Brush down the panini press with olive to ensure that the panini does not stick. Grill the sandwiches for 7-8 minutes or until the sandwiches are crispy on top and melty on the inside. This recipe was slightly inspired by the smoky Frontega chicken sandwich at Panera. However I decided to make it without the chicken and honestly it did not lose any of its appeal. You can also make this in a regular pan just like a classic grilled cheese. Just be careful when flipping it so it does not spill out everywhere. You can use a heavy brick or pot to weigh down the sandwich so that it gets flatter while it's cooking.